Westminster is a diverse community when it comes to types of housing. It has many older homes that do present good investment opportunities at fair CAP (investment rate of return) rates. In addition, there are many areas of Westminster that offer newer and higher end housing. This attracts an economically diverse group of residents which creates stability in rental stock. 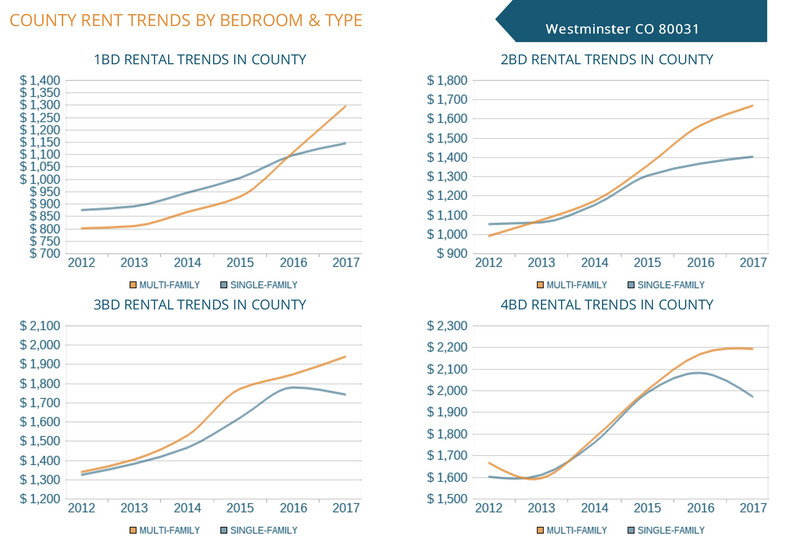 Rental rates are very high in Westminster due in large part to the great location which is close to Denver, but still offering affordable older houses for sales for both investors and home owners. The biggest negative for owning investment real estate in Westminster is the city requirements and oversight of rental properties. The city of Westminster requires that all rental properties be register with the city (and pay a registration fee) AND the city performs annual inspection on each rental property. While well meaning, the results of requiring inspections and having a higher quality standard for Landlords than for owner occupied dwellings creates an unfriendly atmosphere for local investors. Investors should plan for additional expenses in registration and city required repairs that in our opinion can sometimes be excessive, needless, and burdensome. We recommend investors look to neighboring cities such as Thornton or Northglenn which offer more business and landlord friendly policies. How much will my Westminster property rent for?